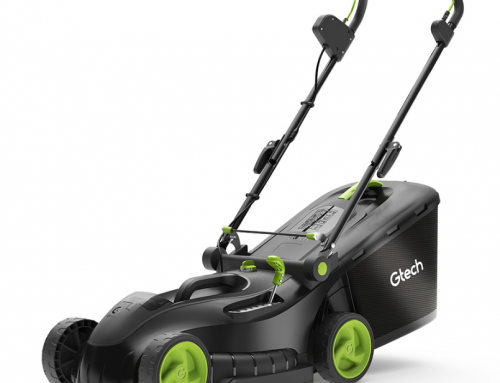 The Yard Force 32cm Cordless Rotary Lawnmower features a fast charging 40 volt 2.5Ah battery that gives around 30 – 35 minutes of run-time and is suitable for lawns up to 300m². The height adjustment on the Yard Force 32cm can be set between 20mm and 60mm and comes supplied with a 30 litre grass box. 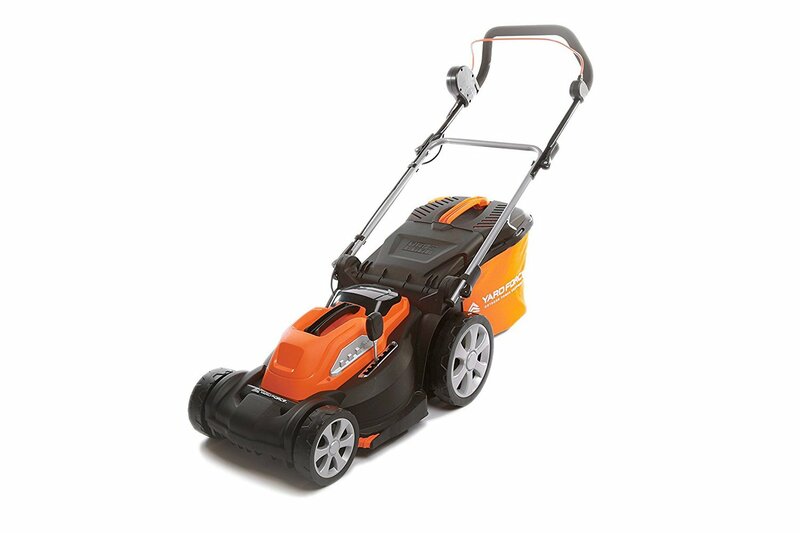 The Yard Force 32cm Cordless Rotary Lawnmower is lightweight at just 9.5kg and has a compact 32cm cutting width. Yard Force is perhaps not the most well-known brand of lawn mowers but they are quickly building a good name for innovation, comfort, and reliability. They make a range of other quality garden equipment. Their products are well backed and after-sales service is great. They are giving many of the more established brands a good run for their money. Speaking of money, Yard Force is also known for great value for money products. 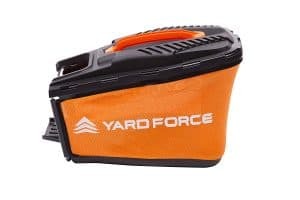 For those not familiar with the brand, it is important to know a bit about Yard Force. They have become a formidable brand in the garden equipment market. They also make impressive pressure washers, chain saws, hedge trimmers, and other equipment. They are rapidly establishing a global market and have already gained a good reputation. They do a range of quality and popular lawn mowers ranging from petrol to electric and cordless. Yard Force is strong on support and aftersales service. Their helpline is available 7 days a week. 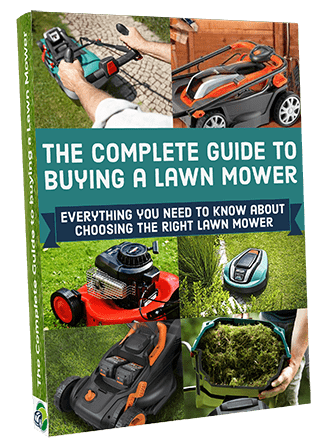 I am going to take you through some of their top cordless lawn mower options starting with the Yard Force 32cm Cordless Rotary Lawnmower. This is a powerful 40V motor powered a Samsung 2.5Ah Li-Ion Battery. It charges in 90- minutes and will deliver around 30 minutes of cutting time. The power is in perfect proportion to the size of the deck and the weight of the machine making a top choice for small to medium lawns. It is ideal for a lawn size up to around 300sqm. How does this compare to the likes of the Bosch Rotak 32 Li? 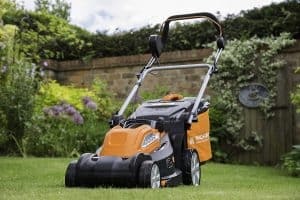 Well very well, the Yard Force 32cm Cordless has the same charge to run time ratio as the Bosch as is around the norm for a mower with a deck size of 32cm. 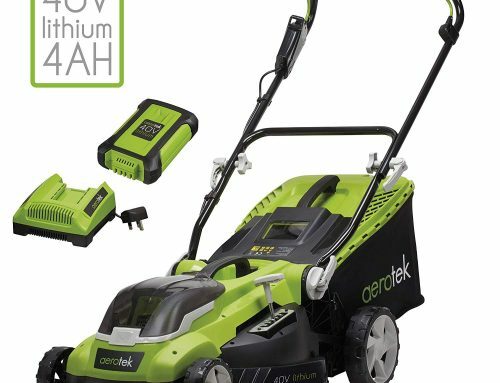 The Bosch does have the option to charge 80% of the battery in 45min, however, the Yard Force will not cost as much, and could be as much as £100 cheaper than the Bosch. Assembly could not be easier. The instructions come with the lawn mower and are clear and detailed, although they probably need not be. First off, get the battery on charge. Then simply adjust the handle height to suit your needs and fasten them. No tools are needed and you do everything by hand. Assembly will literally take you a minute or two. The battery will charge quickly and you will be ready to get stuck in. 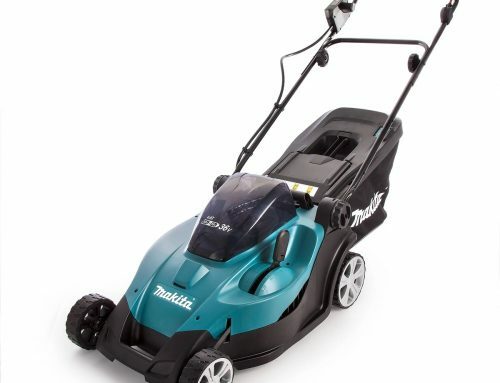 This Yard Force 32cm Cordless Rotary Lawnmower model has a 32cm steel blade. This is ideally suited to small to medium lawns. While it might take a few more passes to complete your mowing you will have improved precision and accuracy as well as greater manoeuvrability. 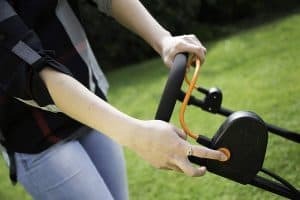 It is ideal if you have twists and turns in the garden and the edges and is great if you have narrow areas as it has a smaller deck than larger models. 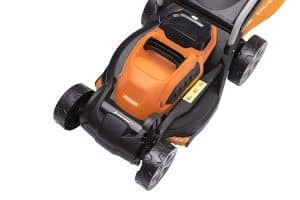 If you wanted an even smaller deck size than the 32cm on this mower, you could take a look at the Flymo Mighti-Mo 300 Li as this has a very compact 30cm deck size. 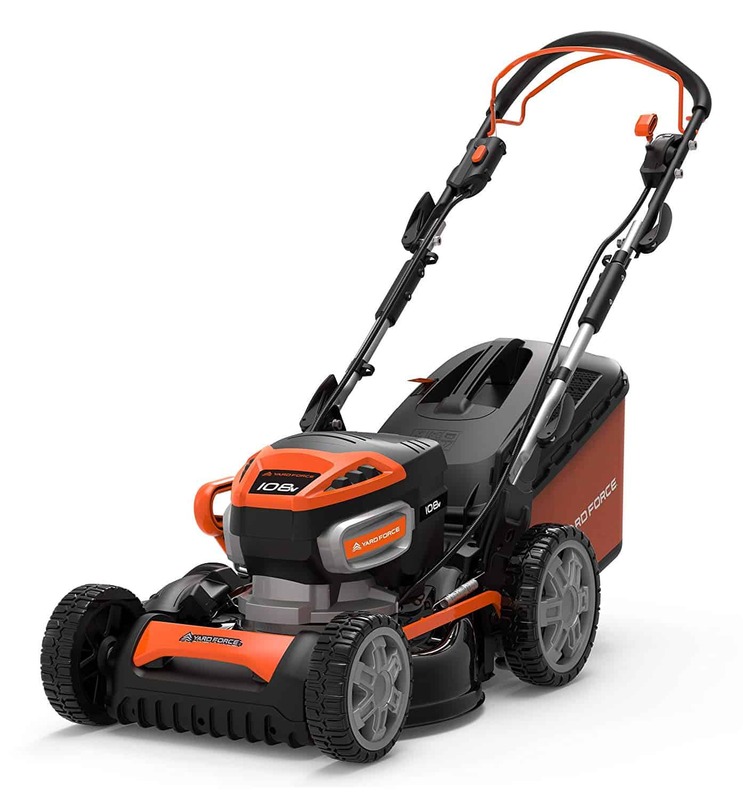 The Yard Force 32cm Cordless Rotary Lawnmower has a fair 5 adjustments for cutting height that range from 20mm to 60mm. The important part is that the central height adjustment means changing the setting requires the simple movement of a lever. This range is more than enough to keep your lawn perfect throughout the year. Compared to many other mowers, the height adjustment lever was not a problem. I have always rated mowers that can have their height adjusted from a single lever mounted in the centre of the mower. Having the lever mounted central to the mower makes the adjustment so much easier and smooth compared to mowers that have them mounted at the front or back with some even having to be adjusted on each side. This Yard Force mower does have the lever located at the front left of the deck. This does make the height adjustment a little more tricky than a centrally located lever but is not major problem when you need to adjust the height as this mower is so light. The slightly larger Yard Force 34cm does have the height adjustment lever located centrally. How does this compare to the Bosch? The Bosch 32 Li only has 3 height adjustments where’s the Yard Force has a very respectable 5 positions. The Yard Force has a very low 20mm position for that very close/short bowling green cut, just be careful, if your lawn is not perfectly level you could end up scalping your lawn. As mentioned above, this model has a 32cm cutting diameter. This size blade and cutting deck are particularly useful and practical in small and medium gardens. It will obviously not be ideal on larger lawns but anything up to around 300sqm and you will be happy with the size and cutting speed. A smaller width gives you greater accuracy and makes moving around tight edges easier. Remember, the smaller the deck size the more practical it will be taking up less storage space. 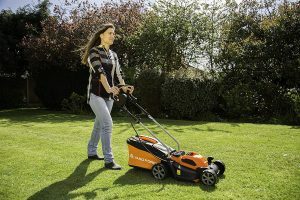 So if storage is limited this mower is ideal as it is narrow, has a fold-able grass box and the handles fold in two places making it extremely compact (the video above shows just how practical this Yard Force mower is). 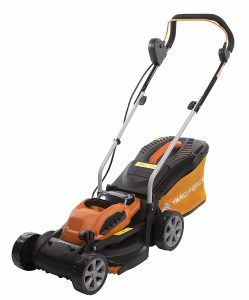 Unusually, in this range of lawn mowers, this Yard Force 32cm Cordless Rotary Lawnmower does have a rear roller. This allows you to create that perfect and precise striped effect on your grass if you wish. These rear rollers not only give you an excellent and professional finish but also add to the stability of the lawn mower when navigating edges and corners. 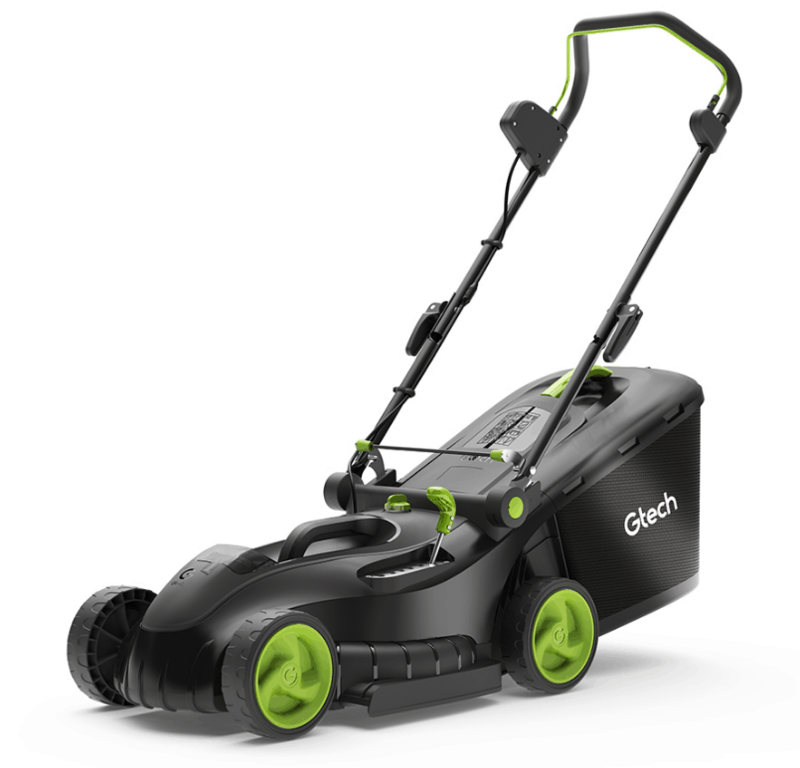 Given the size lawn this Yard Force 32cm Cordless Rotary Lawnmower is designed for, the 30-liter hybrid grass collection bag is perfect. This keeps it light and easy to move and will make your work effortless. It has an indicator to advise you when it is full so there is no need to keep checking. Emptying it out and reconnecting the collection bag is easy. Two other features of the grass bag are that it is designed to compact the clippings making maximum use of the capacity and it also allows for good airflow. 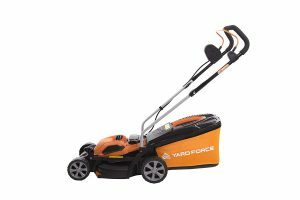 The Yard Force 32cm Cordless Rotary Lawnmower does not have a solid grass box but one that has a hard top and cloth sides and base that can be folded flat. So the advantages of this type of grass box is the minimal storage space, easy to assemble. The downside is the cloth sides and bottom are more prone to damage from tearing etc. however, the quality material on this Yard Force mower seems very hard wearing when compared to other makes. One of the many good things Lawn Force are known for is practical equipment. The first thing you will appreciate when using this model, well, after the quick set-up, is the easy start. As you get going you will appreciate the comfortable soft grip handles that are ergonomically designed for maximum ease of use. Thee handles also fold easily for convenient storage. The lightweight build and good design make it nifty and easy to move. 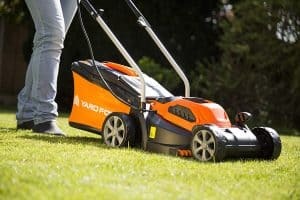 The Yard Force 32cm has a small footprint due to the width of the mower. The 2 clips on the side of the handles are quick release and allows for the top handle to be folded down, this is a nice feature. 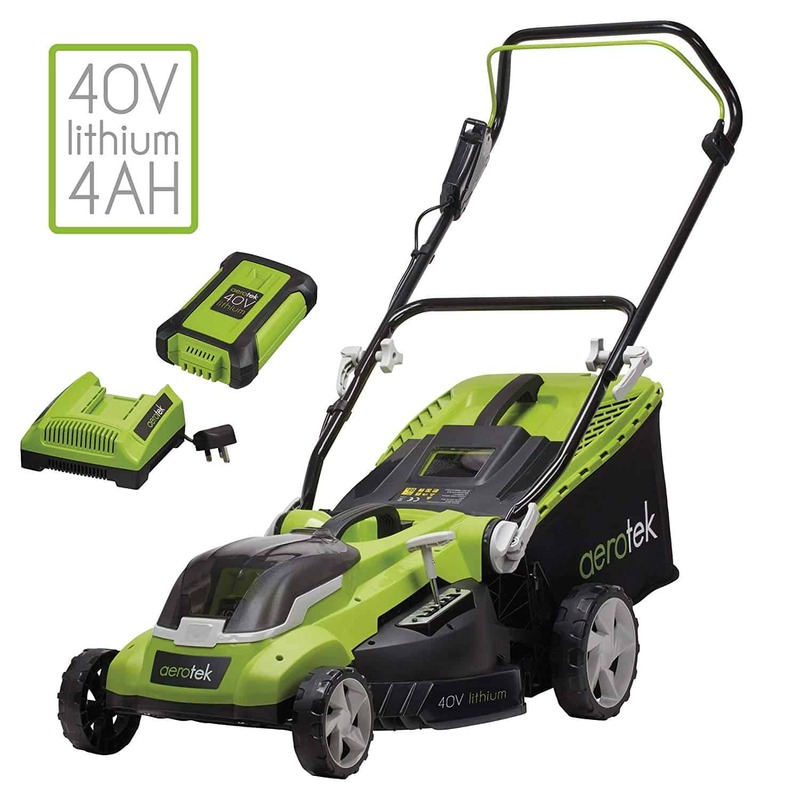 Cordless lawn mowers are by their nature safer than corded or petrol options. Yard Force give detailed instructions and safety recommendations in the instruction manual and provided you follow these you need have no safety concerns. In order to start the lawn mower, you need to use the safety key and then hold in a safety button in order to start the machine. It also has an overload protector. All in all, this is a very safe lawn mower to operate. 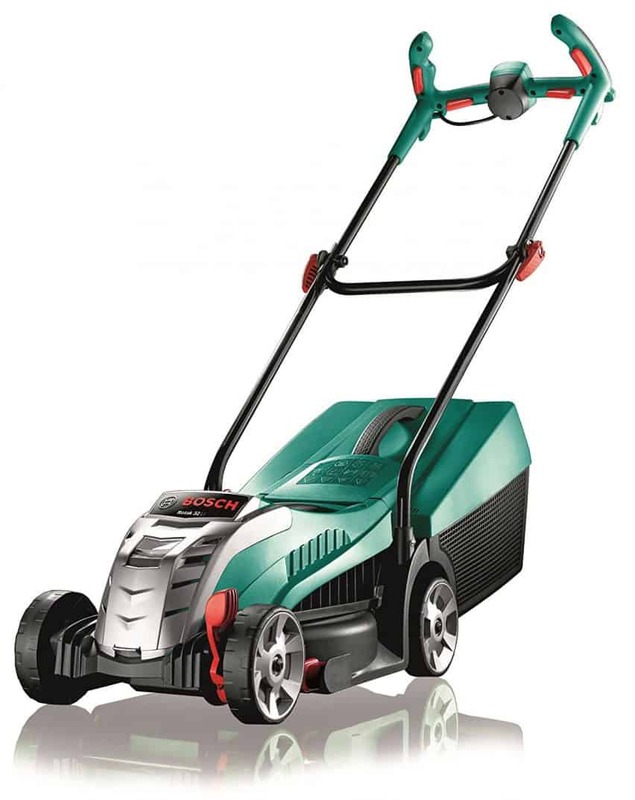 As with most lawn mowers in this category (including the Bosch 32 Li), this model does not have a specific mulching feature. As always, you could always use grass clippings with other organic material to create a great nutrient-rich compost for your lawn as well as the flower beds. If you want something slightly larger, Yard Force have a very similar model but with a 34cm blade. It has the same power and efficient brushless motor. It also uses the Yard ForceTorque Sense Technology. The rest of the features and specifications are pretty much the same. If you want a bit more speed from the larger blade then this is another great option to consider. This is a great option for small to medium gardens. 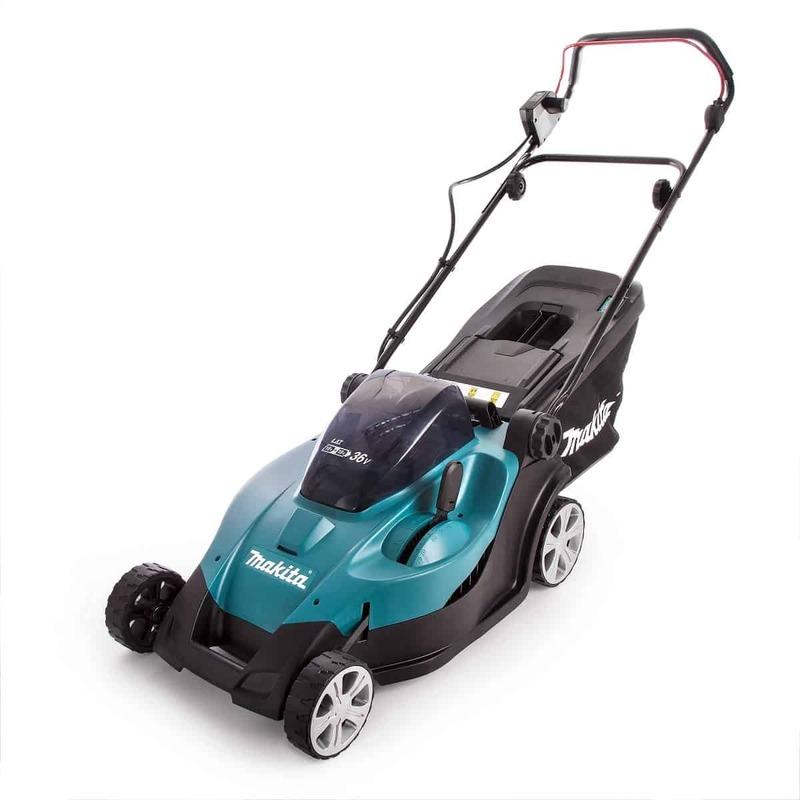 Do not go for it if you have a larger garden but if you have a lawn up to around 300sqm then this is a reliable and dependable lawn mower will work well for you. It has all the features you would want and will give you a great cut every time. Despite being lightweight and easy to move it is durable and powerful. Apart from being safe, easy to use and very good value for money, it is a reliable lawn mower that delivers good results. It is certainly a model to consider. 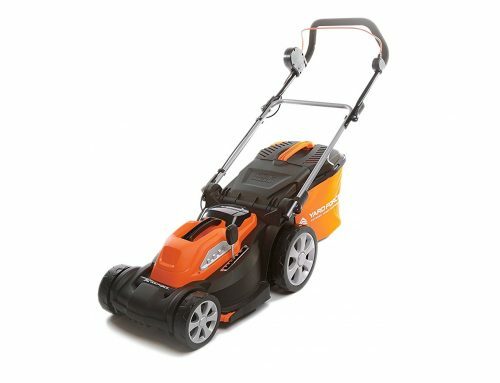 The Yard Force 32cm Cordless Rotary Lawnmower is an ideal choice for small and even medium sized lawns. It is easy to operate and will work with minimal effort from your side. If you want a striped look, this will do it for you with ease and perfection. It is safe, comfortable and easy to use. 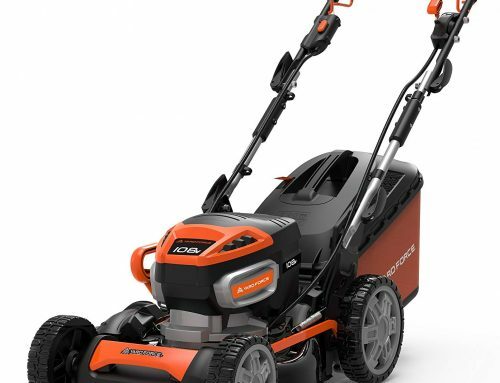 Feedback from those that have purchased this lawn mower is great. Honest feedback from actual customers is a great indicator of the quality of the product. The good 2-year warranty and 7 days a week after sales support will give you additional confidence in this product. Of course this is open to interpretation so if you don’t fall under every single one then don’t worry I’m sure you’ll still love the Yard Force 32cm Cordless Rotary Lawnmower. It has loads of great features that I’m sure you make use of even if you’re not its perfect customer.